Are you shopping to buy the best, most durable round sling at keen prices for 3 tonne loads? Try our 3000 kg round sling, just one from our range of lifting slings here at Rope Services Direct . 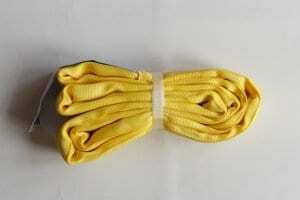 Yellow in colour and 28mm wide, we can provide these 3 tonne round slings in numerous lengths up to 6 metres. All our round lifting slings take pride in the fact they each adhere to the toughest safety regulations (BSI/CE, etc.) and all British made. Ideal for choke-lifting cylindrical shaped items especially, they also offer great protection to a more delicate load due to the outer soft polyester tubing which are not load bearing; it is the twisted polyester yarn hank within which bears the load. These slings are perfect to use instead of lifting chains and wire rope. Being frequently used in sailing and industrial areas, they’re also found in commercial settings as well as industrial ones. This demonstrates their flexibility and versatility. It’s always worth remembering to take weight load limits seriously when using round slings. If in doubt don’t try to lift the load. Never lift more weights than were intended, instead consider products such as round slings and fibre rope slings instead. Ordering a 3 tonne round sling couldn’t be easier! RSD always provide an outstanding selection of 3000 kg slings, giving you a wide choice. To get your new round sling delivered as soon as possible, simply complete our enquiry form. If you’d like some extra advice drop us a line or call us today by ringing 01384 78004. 3000 kg Round Sling Overall rating: 5 out of 5 based on 6 reviews.